Some of Georgia's best defense attorneys won high-stakes, CVN-covered trials throughout the state this year. However, CVN Georgia's 2017 Defense Attorney of the Year set himself apart with a pair of wins in medical malpractice cases this summer. The verdicts: Jurors in the Moradov trial cleared Bailey's client, an Atlanta-area radiologist of malpractice for the cancer death of a 51-year-old man. In Cox, Bailey won a verdict for a physician accused of negligence in the heart attack-related death of a Turner Sports director. The details: In Moradov, the plaintiff, the mother of Shlomo Moradov, claimed a pair of doctors, including Bailey’s client, radiologist Dr. William Bottoms, failed to properly diagnose a kidney growth that ultimately spread as cancer and killed her son. Jurors cleared Bottoms, as well as the other physician, at trial in which the plaintiff requested up to $8 million in damages. In Cox, the widow of Tom Cox, a Turner Sports director of remote operations, claimed Bailey’s client, Dr. Arezou Fatemi, was responsible for her husband’s death by failing to properly diagnose acute coronary syndrome, or ACS. However, Bailey argued the symptoms Cox suffered from when Fatemi saw him, days before his heart attack, were more consistent with a virus, and Fatemi ruled out ACS and other issues as part of a thorough exam. Jurors needed less than three hours to clear Fatemi. 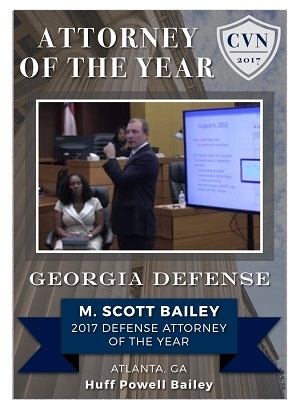 Bailey’s adept trial work set up a stellar summer for the attorney in the courtroom and earned his place as CVN’s Georgia Defense Attorney of 2017. Notably, the win represents a three-year reign for Atlanta firm Huff Powell Bailey. Daniel Huff received the award for 2015, while Page Powell took the title last year. Watch all of Scott Bailey's CVN-covered trials.